There are three places in the world where the merest mention of the name can take me back in heart and spirit. The first are the cliffs at Yesnaby on the mainland of Orkney. Here, the crash of the Atlantic is stalled by Earl Thorfinn’s walls and the salty air is scoured into the finest lines of the skin. The second is the Fairy Pools on the Isle of Skye, where I have swum in the ice clear waters and tasted the pure heart of the Cuillins. The third, and the subject of this review, is the bond store at the Old Pulteney distillery in Wick. I found myself here on an overcast Saturday in 2013. It was the third distillery on a self-guided tour which was to take me around the best parts of Scotland. My true blue Australian friend (who insisted on referring to the drink as ‘OP’) and I didn’t know then that it would be one of only seven distilleries we would visit on that trip. By the time we arrived in Pulteney town, we already had the creeping realisation that most large scale whisky making operations are done along similar lines. Coupled to this, we had satisfied ourselves that whisky makers send their whisky all over the place. Since then we have regularly enjoyed our whisky without feeling the need to visit the place of origin. 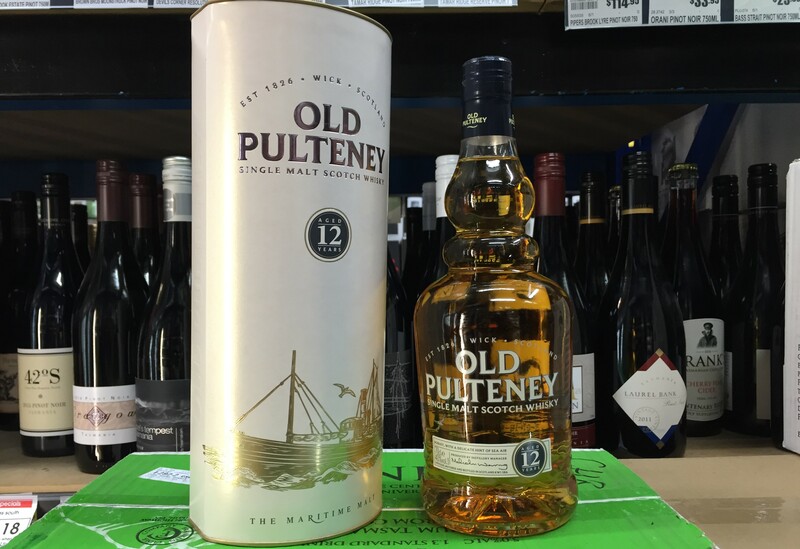 The Old Pulteney distillery was built in 1826 in a town built to support the herring trade. With a lack of foresight uncommon in the Scottish, James Henderson’s lads built the roof too low for the still. When the brand new copper pot still arrived, the swan neck kept clanging off the rafters. Without any ado they applied a choice piece of Scottish logic to the problem and sliced off the top of it. Job done, the still was installed, the top sealed and a pipe bunged on the the side creating the unusual appearance you’ll see today. The bulge further down the giant copper kettle also gave them an idea of how to shape their bottles. 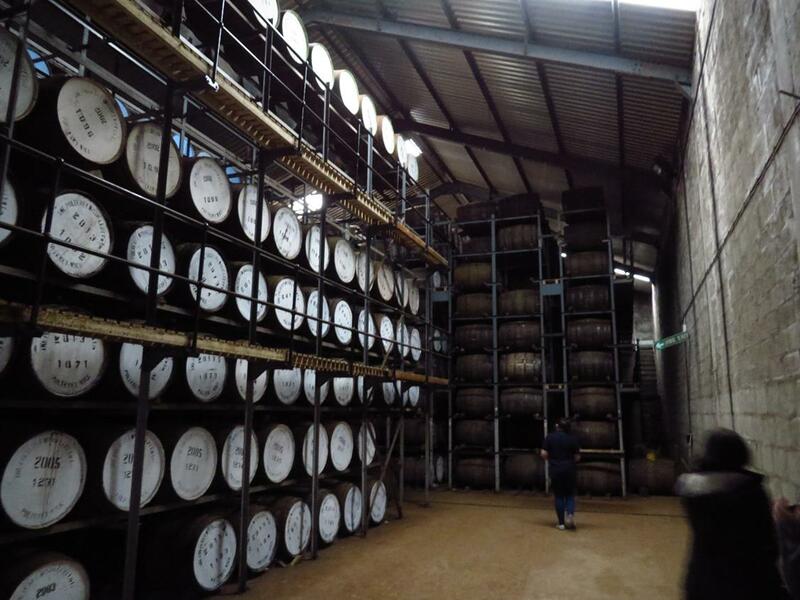 You’ll see all this and more on the tour, proving beyond doubt it is a whisky making process. After you’ve seen the unusual squat stills you’re taken out to the bond store. On the day we visited it started raining at this point. We made a dash towards the barrels, which in my mind were stacked six high (my photographic record shows only four), and the door was shut behind us. While we learned about the maturation process we avoided the tears of the angels and breathed in their share of the whisky; a fine ethereal vapour floating in the salty air. Yes, we all smelt that whisky, we all knew what we were doing and we yes, we all found questions to ask to keep us there longer. Old Pulteney has the taste of the sea in it too, they say. I can’t taste things like that, but Wick is not too far away from the places where the mighty Atlantic meets the moody North Sea and that can’t happen without seriously affecting a drink as emotional as whisky. The salt, they said, coats the barrels and works its way through the grain and into the final product. This may very well be the case. Salt for me is something I put on chips and any other food. It’s never been more complicated than that. As for taste of Old Pulteney 12 year old, it’s a fine single malt, very fine. I find it harsh on the nose, easy on the draw and the burn is frank and satisfying. It has a rich stickling after taste like bronze coins falling over a weir and I’ll always like it because it’s the whisky I drink with my father. I asked Dad why he drinks this particularly spirit. As a seasoned Famous Grouse drinker, it turned out his discernment was a result of him acquiring a bottle at no cost from an appreciative work colleague. His opinion of ‘Aye, it’s a nice one that’ is fair if not particularly detailed or nuanced. I confidently predict that he will continue to drink this brand so long as it remains at his personal initial price point. For me it’s not what goes into a bond store it’s what comes out. That day in Wick an amateur whisky drinker went into the bond store. After delaying as long as I could, a happier, more philosophical and more content amateur whisky drinker came out. The OP lads do the same with their whisky. They wait and they wait and after twelve years a fine drink appears. I don’t know what makes this my homely stand-alone bottle of go-to, or why at times, when I can neither get to Yesnaby nor the Fairy pools of Skye, I can have a drop of Old Pulteney 12 year old and be at both at the same time. It’s a mystery I don’t want to think through too much and if I ever need to know, I can just ask my dad. He knows. Cheers! Not all whisky drinkers have the same emotional connection as our very own captive Scotsman. And yes, it does seem to be rather underrated. Even by me – I’m going to have to drink some more! Ahh!!! Good old maritime favourite! While I’ve not been to the distillery, our Whisky Ladies of Mumbai most enjoyed Karen Walker’s tales of Old Pulteney – including Prince Charles visit!! Sadly I have not been to the distillery either. I am equally jealous of the Cynical Scotsman and will have to make it further north than Inverness on my next trip across the world! Maritime favourite seems to sum this one up though – perhaps only second to the drams produced by Springbank!